This week, Hello! Magazine announced that it has produced the world's first truly 3D magazine cover. We spoke to the Managing Director of the company behind it to reveal the techniques of how it was created. Although augmented reality magazine covers aren't anything new, this cover marks the world's first truly 3D cover. Those who wish to see the cover star, Gary Barlow, in all his resplendent 3D glory need to download the free app and point it at the magazine cover. Callum Macmillan from TimeSlice Films told TechRadar, "We use a camera array, which is essentially imaging the scene. What you end up with is a CGI photograph, that's the asset. The clever bit of delivering it is putting the CGI object into augmented reality." Created in collaboration with TimeSlice and DigiCave, Macmillan was the one to actually take the photograph(s). It was shot with 42 Nikon D300S DSLRs, each equipped with 50mm prime lenses. Macmillan says those particular cameras were chosen for their image quality, and the ability to synchronise with each other. The D300S is three years old now, Callum says that the company will be upgrading to new cameras soon - but for now he is keeping information on which model a secret. As you might imagine, setting up 42 cameras has its own problems. "The difficulty with this is trying to take a camera array and fitting it in with a traditional celebrity photoshoot. We had to take the array up six flights of stairs and then rig it up in someone's kitchen," Macmillan says. Macmillan is hoping that the technology will be more widely adopted throughout the industry, as magazines attempt to engage readers in new and interesting ways. This he says will enable the technology to develop and become smaller, lighter and quicker to use. 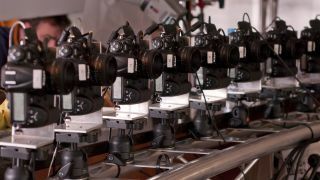 Explaining the reasoning behind using 42 cameras, Macmillan says, "The number sort of varies, we have a lot of cameras and when you're doing 3D you need to have more than you think you will need. You've got to be able to capture every perspective that's necessary to make a 3D model from every angle." This kind of photography differs from other forms of 3D capture, which traditionally involves laser scanning. Macmillan explained that using lasers involves capturing only the form, meaning that a photographer still needs to capture the texture. When using DSLRs to produce a 3D image, both texture and form are captured at the same time, and it also allows for movement. "The difference between using a camera array and laser scanning is that for a laser scan, the subject has to stand really still. With this, you are freer creatively. If they want to jump in the air, as long as you have a fast enough shutter speed and enough light, you can do that." Capturing the scene is also quick with this method. "Although we rigged for about four and a half hours, we got the shot on the first take. All the cameras are fired at the same time, so takes as long as a click to capture the image. We did a couple more images just to be sure, but we had it from the first one." Once the images are rendered, they are then processed by Digicave, which has its own proprietary software for creating the 3D imagery. "They turned that shoot around in about 12 hours," explained Macmillan. "It's actually pretty quick, but there's retouching and so on that needs to be done." Macmillan believes that this technology has the capability to change both what magazine publishers can offer to consumers, but also how we think about photography. "The feedback we've had about it has been really encouraging, the tech enables us to look at photography in a totally different way. The big distinction to make is that no one has done a sculptural photo before, the real innovation is putting the photo into augmented reality. The Hello 3D issue is out now, while the app is available as a free download.